Scalability. Unless the solution can be scaled, it is little use in changing people’s lives. Moreover, most Bottom of the Pyramid businesses tend to be low margin, high volume, high return on capital businesses. The businesses are volume-sensitive and scale is critical. A new price-performance envelope or a new value proposition is critical. Affordability dictates that we must start with a Price-Profit = Cost and not Cost + Profit = Price perspective. Modern technologies. Increasingly it is becoming obvious that dramatic cost reductions are not possible without a judicious use of modern science in the development of products, services, and information technology in delivery of those services. International standards of quality, safety, ecological sustainability, and aesthetics. 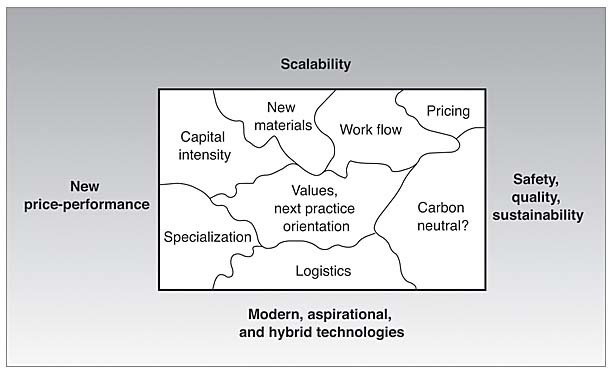 All elements of the business—capital intensity, work flow, volume, manufacturing and logistics, design of products, its maintenance, pricing, use of people, skill development, and building an ecosystem of specialized suppliers—must be challenged and examined without relaxing the self-imposed constraints. A typical innovation sandbox might look like Figure Intro.1. Figure Intro.1: The innovation sandbox. Within the sandbox, there can be multiple innovations—be it centered on capital intensity or workflow. This approach—constrained innovation—is a critical ingredient to create fresh thinking in the organization. None of the boundary conditions can be met with traditional ways of doing business. Co-create solutions: Managers who are used to developed markets are often surprised by the sophistication and demands of the Bottom of the Pyramid markets. It is not just about making cheap versions of the products sold in developed markets. Bottom of the Pyramid markets demand that managers acquire “local knowledge and local trust” before they develop markets—be it micro consumers or micro producers. It is unrealistic to expect farmers to sell their meager crops to ITC and abandon their local trader unless they develop trust in ITC. Similarly, don’t expect people to abandon their moneylender before they know that the micro-finance arm of the bank is reliable and will stay with them. Neither should we expect them to change their habits before they are confident that the new animal feed is both efficacious and will be available when needed. There are three different pressures that must be understood. The role of the private sector is to bring world-class products and global standards of quality and safety to these markets. At the same time, the solutions must be locally responsive. Global-local tension is real. Secondly, to provide high quality at low cost, firms must focus on capital intensity of the business and the overheads. Traditional ways of doing business will not do. A lean business and organization is required. This represents a major tension in multinational firms as this challenges their existing business models. Finally, firms have to rapidly learn about the local consumers, their needs, and their aspirations at low cost. Co-creation reduces investment needs as more share in the investment. It reduces risk as the key players jointly develop the solution. For example, in the case of British Petroleum, the BP team, the Indian Institute of Science, nongovernmental organizations, and the village level consumers, jointly developed the stove. Managers must learn that the Bottom of the Pyramid markets require a new level of collaboration between civil society and the private sector. It also requires a new respect for consumers as co-creators of solutions and not just passive recipients of a product or service. A new concept of scale: Scale can be achieved in many ways. The Bottom of the Pyramid forces us to think differently. Consider the question: “I want to build a dairy that is world scale with a capacity to process 6 to 7 million kilograms of milk per day. How do I plan for it?” This question often gets people calculating how many cattle and how big a cattle farm one should have. Amul in India, the largest processor of raw milk in the world, originates the milk in 10,000 plus villages covering more than 2.2 million farmers. Each one might have only one or two heads of cattle. But by building village level collection centers that aggregate raw milk from a large pool of farmers, and processing it centrally, Amul built virtual scale. By paying the farmers for quality (for example, volume and fat content) and by sophisticated logistics from collection centers to world-class processing units, Amul totally avoided the problems of managing large herds centrally. Decentralized origination, centralized processing, and marketing seem to be the key. The Bottom of the Pyramid allows a new approach to scale and organization. Further, most of these organizations are very lean. Most of the systems are self-regulating and do not need much supervision. Use technology: It is normal to assume that Bottom of the Pyramid markets are not high-tech markets. Those managers who grew up with the concepts such as “product life cycle view of international business” (meaning that all new technology solutions are developed in the West, and they move to poor and developing countries over time) will find Bottom of the Pyramid markets providing a big surprise. You will find Aravind or Narayana Hrudayalaya using the latest medical technology. For example, Narayana Hrudayalaya prefers digital to analog products even if they are expensive. An analog X-ray machine might be inexpensive, but the film is not. Capital expenditure is lower but variable costs are higher. A large throughput system (scale) makes this an unattractive proposition. Further, digital X-ray allows pictures to be uploaded for examination by experts at remote locations. Similarly, Airtel uses the most advanced technology. It converted its fixed costs into variable costs by outsourcing infrastructure investments to LM Ericsson and IBM. Airtel pays a fee for each consumer added; a variable cost. The use of information technology to manage the logistics and manufacturing infrastructure is widespread. ITC depends on its network of PCs to engage and connect with the farmers. The ITC network is the heart of its operation. Jaipur Rugs is starting to invest in an IT system that tracks each weaver and each order along its highly distributed system. Remittances and rudimentary banking functions are moving to the cell phone. There is a tense negotiation between telecom operators and the financial services firms in Africa and India. The lessons are clear. Advanced technology is critical for ensuring the quality of product or service delivered. More important, advanced technologies wisely deployed reduce the overall costs (for example, cost per patient, cost per minute of cell phone usage, cost per transaction), if the investments can be leveraged with high levels of usage. Capital expenditure in the absolute (for example, $1 million dollars) is different from asking what if we had 5,000 patients per week rather than 50? Secondly, advanced technologies lead to innovative and new applications, such as cell phone-based banking. Finally, IT solutions provide real-time information on inventories in the system, receivables, and the changing patterns of consumption. Well-developed IT systems provide real-time alerts to managers. Sustainability will emerge as a source of innovations at the Bottom of the Pyramid: The planet is under stress—be it access to water, deforestation, pollution, or green house gas emissions. This is a familiar story. What if we added an additional 3 to 4 billion people as micro producers and consumers to the current 2 billion? Sustainability will become a major impediment. Nobody can deny that the poor have a right to a better standard of living—be it access to safe water, better food and sanitation, and better education. The pressure to serve an additional 3 to 4 billion and at the same time protect the environment will focus attention on sustainability as never before. New innovations, large and small, will be needed. For example, given interruptions in power and water supply, an Indian firm, Godrej, has introduced a washing machine that remembers when the power was cut off in the washing cycle. When power resumes, it starts where it left off rather than from the beginning. This saves both water and power. Packaging is getting its due attention. Biodegradable and new forms of packaging are becoming an imperative. So are new sources of renewable energy. We should expect to see the Bottom of the Pyramid as a major source of ecologically sustainable innovations in the near future. The challenge is market development: The biggest challenge to managers who are trained to “serve existing markets efficiently” is to change their mindsets when they approach BOP markets. The cell phone or microcredit are good examples. Airtel had to develop the market. The tele-density in India in 2002 was so low that it was pathetic. They and others had to build an urban and now a rural market for connectivity and value-added services. In every instance of success, managers had to “forget” traditional ways of approaching the business and develop a new and innovative approach. For example, Airtel had to give up on average revenue per customer or user (ARPU) as a measure of attractiveness and focus on the contribution per minute of cell phone time. This is true for Airtel as much as for ICICI, Aravind, or Voxiva. The goal is to build new markets, organize the “unorganized markets,” build new ecosystems, and create new business models. The challenge is about innovating the management processes within the firm that allows managers in the field to defy received wisdom and build a model that works. It is beyond “recontextualizing” the existing business models. It is about management innovation and market development. Bottom of the Pyramid markets are evolving rapidly: It is important that we recognize that the Bottom of the Pyramid markets are evolving rapidly. Just measuring the Bottom of the Pyramid segments by income (as is done normally) hides the interesting transitions that are taking place in the market. It is better to use life style measures (LSMs) of the Bottom of the Pyramid consumers. What life style do they aspire to? What life style do they invest in? How do we explain a resident of a slum without clean drinking water and sewage, focusing on kitchen appliances, cell phones, and color televisions? How do we explain a poor mother investing in her son’s education through private tuition even when she goes hungry? Or a farmer investing in his cattle before improving his house? Two forces are at work here. First, individuals are making choices to their life style that do not necessarily follow our perceptions of what someone at a particular income level should do. Better informed and better focused on the aspirations for themselves and their families, their decision-making criteria are changing rapidly. We see it in their approach to health care, education, and connectivity. Secondly, the economic pyramid, as predicted in the original version of this book, is slowly morphing into a diamond; not all around the world but certainly in major markets such as China, India, South Africa, Turkey, Brazil, and Indonesia. This will have a profound impact on the opportunities for growth. We could add to the lessons learned. However, it is important to note that this is a rapidly changing and evolving opportunity. As micro consumers, micro producers, and micro entrepreneurs and innovators, the poor are rapidly becoming sophisticated and demanding. Managers need to develop the capacity to anticipate and continuously adapt.